I was chosen to dance Bhangra! I was so excited! I have actually never seen a Bhangra dance, and I missed it when my clients performed at my working place 2 years ago. And we have two more days to the finale night! Tidbits: Yes! It is an interesting dance! I realised I have made a wish unconsciously and it came true in this dance, but I regretted for making such wish nonchalantly when I detected some unhappiness... Anyhow, I danced with a smile and pour my heart into perfecting it. I was calling out to sponsors to remind them of the upcoming finale performance this coming Sunday. And I took the chance to call up mum to invite her too. I was happy to hear mum was enthusiastic to watch the performance! Tidbits: I was actually reluctant to invite her, because I'm always deemed as the black sheep of the family and the 'forgotten daughter.' So asking for support from family sometimes seem to be a wishful thinking. Out of my expectation, I had a gift from my friend who introduced me to SSEAYP! She came one morning to deliver some items to my contingent, and she brought along a bottle of Roselle drink! Ah!!! I was so happy that I went giggling in the room oblivious to my team members. I finally had something that belongs to my civilisation! Spinoff: I shivered as I happily drank it, because she forgot to put sugar in the juice. "Ah!!! Mari, kamu masuk dance Borneo (Come, you will be dancing the Borneo dance)." surprise ... I stood there to register what he just said, and then looked around. Swiftly, I replied OK, and he immediately went into teaching mode. Spinoff: Did he just say Borneo dance?! Of course I want! I have always wanted to try out that dance! I love to see its hand movement dance. We have also prepared a Borneo dance during our personal gathering for the trip, and I had quietly wished I could dance that too. Thinking back... I felt God heard that wish and granted it by giving me the perfect time to walk by. Anyways, I found out where the majority had gone. They fled when they sensed the instructor was going to teach a new dance. I was the accidental member to to join in the dance whence the instructor did not even thought of me. I was just a convenience. Regardless of that, I was happy to be able to dance Borneo dance. 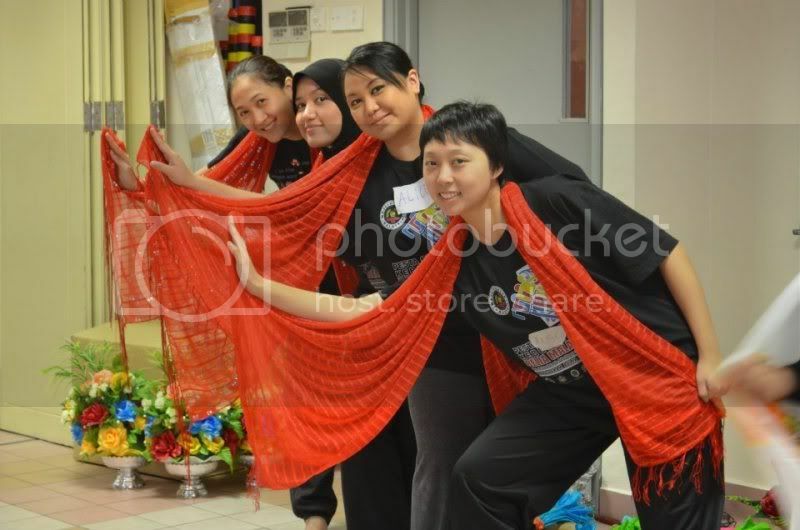 I like this dance to the extend I don't mind volunteering despite dancing is not my cup of tea. I have not danced for more than 10 years since I left Penang. My last performance was very memorable and yet traumatize due to the gruelling practice we had undergone: 10 months: 3 days a week of practice for an-hour opening ceremony performance. I remember walking into the stadium dome before the sun rises and leaving the place when the sky is emblazoned with stars. Anyhow, I really danced it with pure enjoyment and relaxation. A smile can always be found on my face during this dance. Aw... we are on the second day of our practice. I rewrote my name on the sticker and pasted it on my tee. After that, all the girls danced the second dance. Me and three more danced a different set with a red scarf.